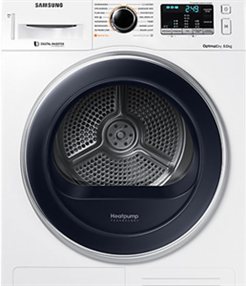 Does your laundry no longer comes dry out of the tumble dryer? Then you may have to replace a part. 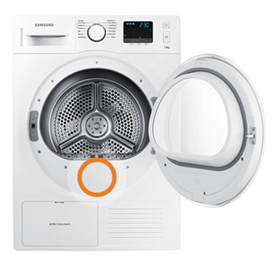 As an authorised partner, we offer a wide range of Samsung clothes dryer parts, such as filters, fluff filters and sensors. If you order a part today, it will be dispatched on the same day. You can order 100% original dryer parts by entering the model code in the field above. To order parts for your dryer on Samsungparts.eu, you always need the model code of your appliance. This code is essential to order the correct part for your particular appliance. On Samsung dryers, this code is always included on a sticker on the inside of the door and is a combination of letters and numbers. Enter the model code in the grey bar above and choose the part you want on the product page. Need some advice while ordering? Our Support desk is ready to help you. Filters: if the filter is dirty, your dryer will not operate optimally. After a certain number of usages, the dryer's fluff filter should also be cleaned. If the filter smells or has visible holes in it, it is time to replace it. Temperature sensor: is your wash still damp after coming out of the dryer or is your dryer overheating? Then the temperature sensor may be broken. Before having it repaired, you should always check whether the sensor is dirty. Would you like some help to order parts? Need help choosing the right part or can't find the model code? Our Support desk staff members are experts in the field of household appliances and would be happy to advise you on the appropriate Samsung dryer parts. Contact them at any time for advice.